Not sure why– but I am not too able to do 2 things at once. So as long as I am stuck over at falling in love with Pinterest– my blog here might just get pretty jealous. You can view my boards here. 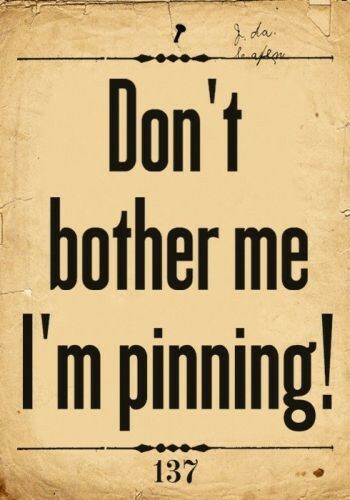 And thanks to those of you that kept messaging me asking me WHY I`m not pinning yet– you know who you are (Shelly Y, Christy, Audrey, Shannon, Thelma, etc). Thanks, you know me better than I know myself. Honestly, I hope to be back soon. Okay Jenny, I just spent the last 15 minutes going through you pins, and all I have to say to you is… you are fabulous. Yup. i would never get a thing done. it’s so alluring tho….maybe because when i visualize something it ‘works’ for me? 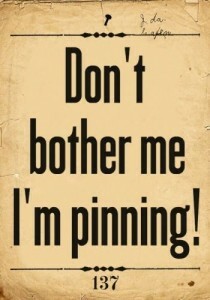 Yup, staying away from pinterest at the moment. Love looking at other people’s boards a little (I mean a LOT, but have only done it a little). Down right scary how addicting it could be!! now. to go check out your boards and get lost in the abyss of pinterest once again! !